Jumpman Gaming Ltd have been responsible for numerous online casinos over recent years but their prolific nature has increased a startling amount over the last 12 months. One of the newest online casino sites to be added to the Jumpman portfolio is London Jackpots, and the first thing we notice is that Jumpman still haven’t changed its most irritating and irresponsible tool. If you go to another tab in your browser while London jackpots is open, it, like other Jumpman sites, will implore you to come back. Now, there is no doubt that the intentions were pure when this idea was created, but with the focus on vulnerable gamblers as high as it is at the moment, begging those who have stepped away from an online casino to return is an atrocious approach and one that needs to stop sooner rather than later. This isn’t the only issue London Jackpots has, it is also, as the name suggests, one of many online casinos based on all things British. There’s nothing wrong with London as a theme, and it perhaps feels a little less exclusive than the likes of All British casino, but it still runs the risk of making those outside of the UK feel unwelcome, which isn’t a problem currently but may become one if this casino ever looks to expand into other parts of the world. Normally when you get a site that is themed similarly to this one, it will be full of predictable London imagery such as red buses and phone boxes, as well as a few famous landmarks. It’s nice that London jackpots doesn’t do this, but it would be substantially more pleasing if the site did anything else instead, but it doesn’t. Like all Jumpman sites, all you get at London Jackpots is a banner across the top of the page that includes a simple logo (in this case, the name of the casino with a Union flag playing the part of the ‘o’ in ‘London) and some basic design, which in this case is a roulette wheel and some information on promotions. That’s pretty much where it stops, shy of the flag in the logo there is nothing associated with London within the design here, and when you scroll down the page past the banner, you are met with nothing but a white background behind various thumbnails allowing access to popular games. This is pretty much the same at every site on this network, and it never looks good enough. 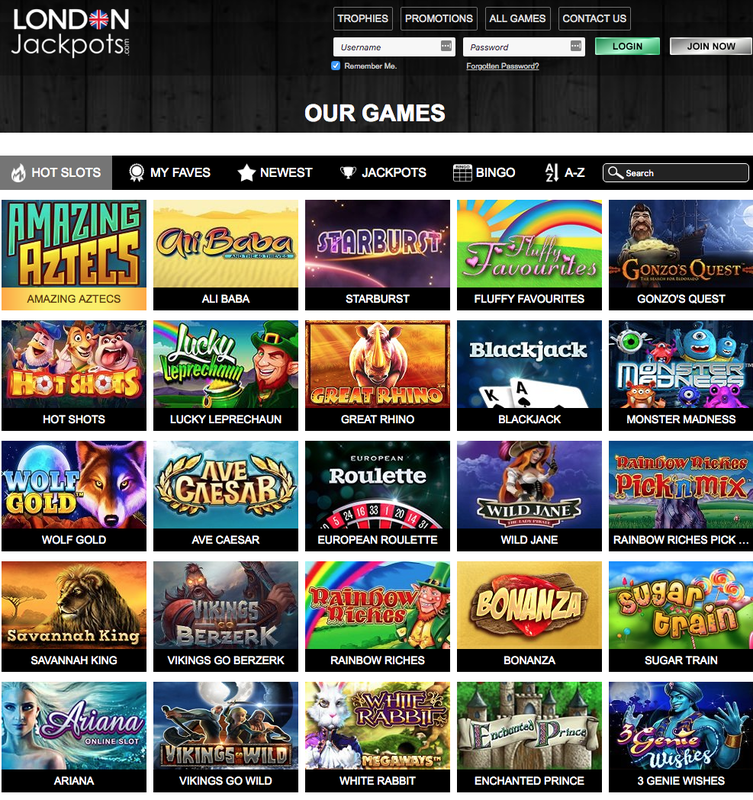 One this that does tend to vary when it comes to Jumpman Gaming sites is the collection of games on offer, and in that regard, London Jackpots is ahead of most of its sister sites. With titles coming from the likes of 1X2 Network, Big Time Gaming, Core Gaming, ELK Studios, Eyecon, Gamevy, Genii, IWG, iSoftBet, Jumpman Gaming, Microgaming, NetEnt, NextGen Gaming, PariPlay, Playson, Pragmatic Play, SG Digital, and Yggdrasil, there’s definitely not a shortage of choice here. There is a question that arises though, which is the same one that just be asked of all Jumpman sites, is the array of games available at London Jackpots enough to make up for the disappointed look and style of the site? As much as the answer to that is subjective and depends entirely on how important a wide range of games is to you, the truth is that there are better options available regardless. Yes, there are a lot of games here, but it’s not the most you’ll find anywhere, that are many other sites that are put together substantially better and have at least as good a choice of games, go to them.